Here you can find a strain description about Spice (Mr. Nice) and also some user-based reviews and infos directly from the SeedFinder (if available). 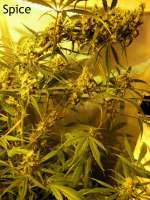 You can also find the offers and auctions here if Spice (Mr. Nice) cannabis seeds are on stock at MyCannapot right now. Spice up your life with MRS. NICE! She is bubbling with rapid growth , well endowed and an absolute beauty as her name suggests. Her pedigree has blossomed out of the union of a Hawaiian indica x Hawaiian sativa and is a stable hybrid that no curry eater can live without.Probably one of the most upright self supporting plants you will ever grow Spice finishes within 9 weeks but you can find a phenotype that will be ready in 7 weeks with some good selection. Spice is a good all round plant that would be welcome into any garden.This is a plant that would win a beauty show if it wore a bikini...asthetically she is a tribute to mother nature .Large sprayed out leaves, a thick strong stem and a green color deep and rich...Put some SPICE into your life! Flowering period: Expect indoor flowering to be completed between 48-60 days.In the northern hemisphere it should be ready by late Sep to early Oct, and in the southern hemisphere it should be ready by end of March to early part of April. Special Notes: A winner of hearts for its economic quick returns and tantalizing taste. A full-flavored product to be enjoyed whole-heartedly. Spice (Mr. Nice) is not available at our shop at the moment!